To find the cheapest flight from Dubai to Glasgow; use the flight comparison tool on the left as well as the list of airlines (with links to their respective online reservation systems) below. Emirates is the only airline providing a direct flight to Glasgow; while British Airways, KLM (Royal Dutch Airlines) and Virgin Atlantic provide 1-stop flight services. 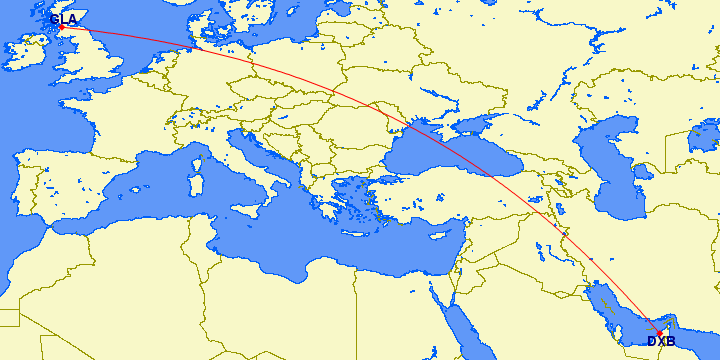 The distance between Dubai International Airport and Glasgow International Airport is some 5,848km. Glasgow (UK) is 3-4 hours behind Dubai (United Arab Emirates). We suggest setting your watch to Glasgow's time as soon as you board your flight (the earlier you begin acclimatising to the new time zone the easier). A map centred on Glasgow with its International Airport pinpointed. Click the link provided to find directions of locations in and around the city. Visit the Glasgow Green which houses one of the largest terracotta fountains in the world - the Doulton fountain. Visit the Mitchell Library, one of the best public buildings in Glasgow and the largest municipal public reference library in Europe. Visit the Tall Ship - built in 1896, one of only five clyde-built sailing ships that still afloat in the world today. Emirates upgrades its second daily Glasgow flight by introducing a Boeing 777-300ER aircraft that seats 360. This will increase the weekly passenger capacity to over 650 seats. Emirates introduces a second daily flight between Dubai and Glasgow operated by a three-class Airbus A340-300 with seating for 12 First Class, 42 Business Class and 213 Economy passengers. Emirates commences daily flights between Dubai and Glasgow, United Kingdom. Glasgow features an Oceanic climate with cool and overcast winter weather and temperamental summer months (ranging from cool and wet to sunny and warm). The general weather pattern in Glasgow provides more humid than dry periods. When visiting Glasgow, we recommend booking a room at the Rab Ha's Hotel. The rooms are small but beautifully decorated and equipped with practical ammenities such as tea & coffee making facilities, Sky TV and an IPod Dock. The hotel is located in the merchant district of the city. A lot of shopping opportunities (Princess Square & Argyll Arcade), galleries (the Gallery of Modern Art & the Buchanan Galleries) and other landmarks (the City of Glasgow College & the St Andrews Cathedral) are available within walking distance from the Rab Ha's.